Apartament with swimming pool and green garden view. Apartment "Laguna Rosa" is Located in Playa Flamenca. Playa Flamenca is a known tourist resort. Located by the sea and lagoons, from which salt is extracted to this day. Thanks to this, there is a microclimate in the locality of this area, which has therapeutic properties which attracts tourists from all over Europe. This region has been recognized by the World Health Organization as one of the healthiest places in the world. An attractive apartment for holiday rental in Playa Flamenca, Costa Blanca South - just 500m from the beach. The property makes up part of Residencial Oleza Garden Village I - an attractive and quiet residential area boasting a 2 wonderful swimming pools green areas. The property is after complete renovation and full furnished. The apartment has two levels, 1 bedroom, 1 bathroom upstairs, spacious lounge-diner, well-appointed kitchen, plus a sun terrace with garden and swimming pool views downstairs. The property comes with Air-Conditioning as standard. WIFI available upon request. The complex has a gate entry system and has a car parking. The apartment is within walking distance to shops, bars, restaurants, a bus stop, plus the wonderful sandy blue flag beaches of Playa Flamenca ( 500 m ) and La Zenia ( 1 km ). 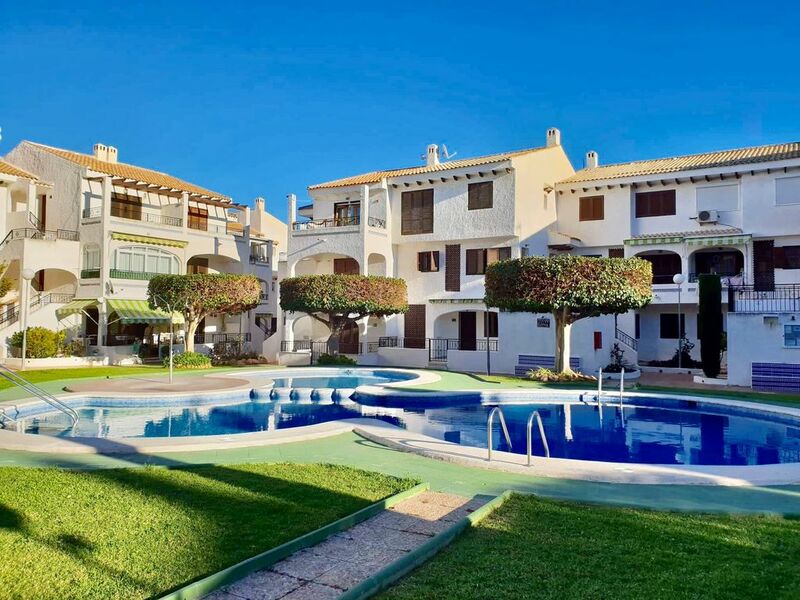 Playa Flamenca boasts an array of services and amenities and is a short drive from many fantastic golf courses including Las Ramblas, Campoamor and La Colinas. San Javier airport is only 20 a minute drive away, and Alicante airport a 45 minute drive. You have a range of services and amenities at hand including shops, bars, restaurants and not forgetting the Zenia Boulevard shopping centre ( 1,2 km ). Playa Flamenca also hosts its own street market every Saturday ( 5 minutes walk ) - here you can purchase a selection of locally grown produce. Playa Flamenca is a perfect coastal destination for both holidaying and permanent living a like. - Finally cleaning - charge 55 euro to pay on arrival. - Transport from/to airport - Alicante 55 € or Murcia - 60 euro each way. If you looking for something for you and yours family that place is for you. Beach in Playa Flamenca is not to big and you have special place for walk. Everything Perfect ;-) we was on January and we very suprised this time of year weather was fantastic - beetwen 18-22 degres. We spend little bit time on the beach, we walk, we travel - very closed that place are a lots attractions for everyone. Apartament is very clean, it’s quaiet area with nice view ( swimming pool and garden ) but any way, few minutes walk on the beach and to the restaurants. Spanish super,arcet Mercadona - 2 minutes walk. Owners of apartment very helpfull, great contact all the time. I recomended for everyone any time of the year. Definitely we are back again. 😘�🥇� we was very suprised when owners leave for us welcome gift - that was bottle of wine from local winery. Highly recommended this place. Beach is only 10min walking distance, shop 2min walking distance, and if you don't won't to go on the beach you can use the swimming pool which is located just at the front of apartment. Apartament was very clean and we'll equipment ( the only thing we would add it up is a frying pan :-). Communication with the host was excellent. Definitely would go back there. We spend few great a days with family. Fantastic place, close to the beach and restaurants. Supermarcet few meters walk. Nice view and very clean apartament, everything was like on the picture and information. Very good contact with owners. We recomended this place 100%.